Psst, you have your picture as your avatar. As I said previously in one of the draws (Werevolvo's one), there's no need of pictures. Using avatars, situations seen on the forum, common private jokes and stuff like that is a funnier and better source of inspiration than simple pics that may not represent forumites as we can see them. someone make an icon or sig out of that grandma! Like I said, it'd be hard to turn it into something funny. LOL GAZUS. That's excellent. I shouldn't have ever doubted you. 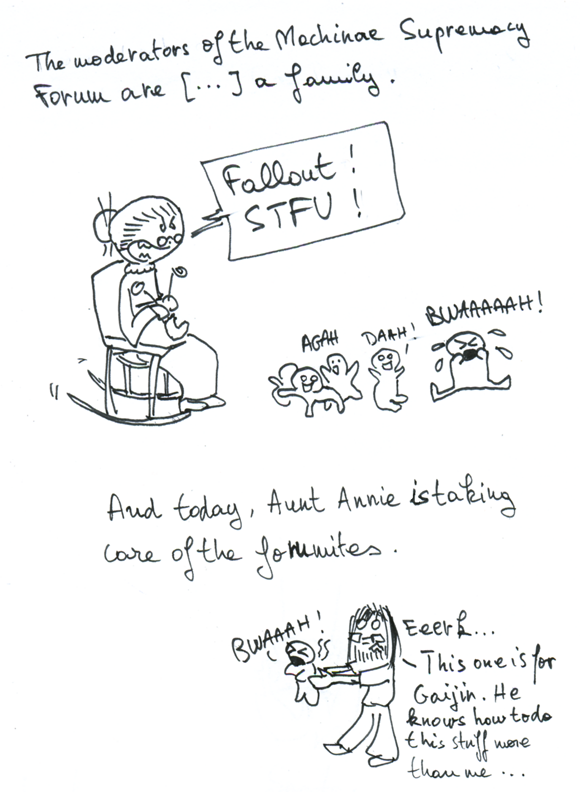 Ahahahahah, aunt annie. hah. hahah. ah. Draw mee! Your drawn. Look at the soiled baby. Another version of you may come if I find anything that could represent you. JUST CALL ME AUNTIE ANNIE. As I said previously, take no offense. That was for the gag including Aunt Annie. You'll have a better glory time as soon as I draw it. There's a fly on my monitor.